nopCommerce version 2.8 plugin that supports the SIM (Server Integrated Method) of Authorize.Net. Authorize.net SIM (Server Integration Method) provides a customizable, secure hosted payment form to make integration easy for nopCommerce merchants that do not have an SSL certificate. Use this link to sign up for an Authorize.Net account and receive a discount on the monthly fees! If you are unable to obtain an SSL certificate or do not have the necessary resources to program and host your own payment form, the Server Integration Method (SIM) is your best option for integrating to the Authorize.net payment gateway. SIM uses scripting techniques to authenticate transactions with a unique transaction fingerprint. The Authorize.Net Payment Gateway handles all the steps in the secure transaction process - payment data collection, data submission and the response to the customer - while keeping Authorize.Net virtually transparent. Payment gateway hosted payment form employs 128-bit SSL data encryption. Digital fingerprints enhance security, providing multiple layers of authentication. Customize the look and feel of the payment gateway hosted payment form. Authorize.Net understands the evolving needs of merchants — their payment gateway solutions are designed to help your business grow. Accept a Variety of Payments – All major credit cards, eCheck.Net (electronic checks from bank accounts), gift cards, and debits. Manage Transactions – A full-featured Merchant Interface enables merchants to monitor and control payments. Prevent Fraud – Identify suspicious transactions with value-added products and built-in fraud tools like AVS and CVV2. Risk Management – Sensitive data is stored in the Authorize.Net PCI-compliant data center, not on the merchant's web site. Receive Payments Quickly – Funds are automatically deposited into the merchant bank account every 24 hours. Free Help – Authorize.Net provides live technical and account support to merchants Monday - Friday, as well as access to online documentation and user guides. Transaction Mode Authorize – This transaction type is sent for authorization only. The authorization places the funds on hold with the customer’s bank, but until the transaction is captured, the funds transfer process does not take place. You can submit the transaction for capture manually in the nopCommerce admin panel, or the Authorize.Net Merchant Interface. This can be useful in situations where you need to make a sale, but won't be able to ship merchandise for several days; you can authorize the transaction to ensure the availability of funds, then, once you have shipped, you can capture the transaction to obtain the funds. Transaction Mode Authorize and Capture – This type of transaction is completely automatic. The transaction will settle out with your next batch settlement. Additional Fee – You can set an additional fee amount that the customer will be charged for using this payment method. The fee can be a fixed amount, or a percentage of the order total amount. Pass Items to Authorize.Net – This feature allows you to send an itemized order to be displayed on the Authorize.Net hosted payment form, or just send the total dollar amount without listing the items. Version Number – Allows you to set the version number of the Authorize.Net API that you wish to use. Email – Automatically sends the customers email address to Authorize.Net so they can send a payment confirmation email to the customer. 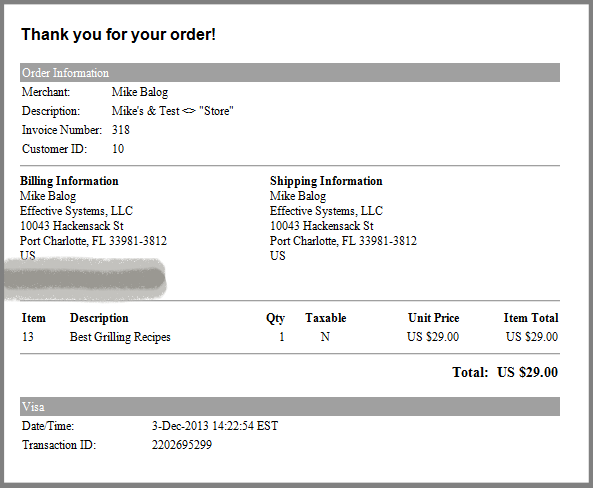 Sends Addresses – All bill to and ship to address lines are sent to the Authorize.Net hosted Payment form to prepopulate the form, so the customer does not have to fill it out manually. You can control which fields on the prepopulated form the customer can edit through the Merchant Interface at Authorize.Net. Tax – Sends the taxable status of each item and the total tax amount to Authorize.Net. Relay Response – Uses the Relay Response method of receiving the payment confirmation data back from Authorize.Net to nopCommerce to update the order status. 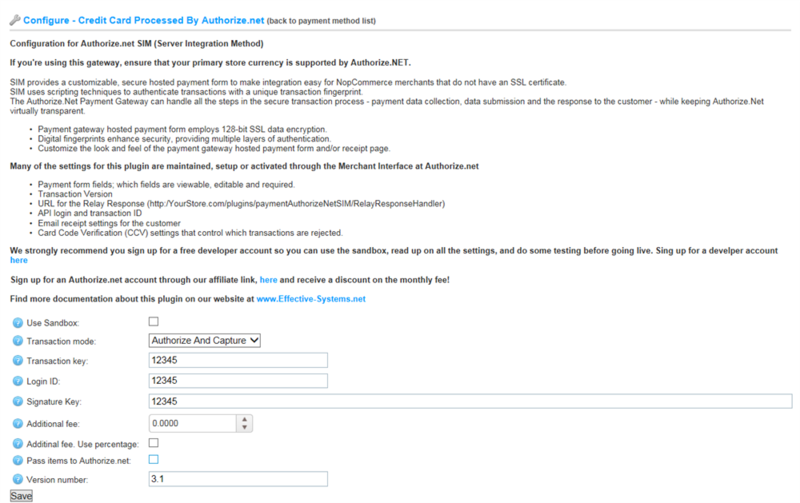 Cancel Link – Creates a “Cancel” link on the Authorize.Net hosted payment form. When the customer clicks on the link, it returns them to a page on your site that gives an informative message telling them that the payment submission was cancelled, and directs them to try submitting the payment again. Automated Recurring Billing Supported manually through the Authorize.Net Merchant Interface. Voids - Supported manually through the Authorize.Net Merchant Interface. Refunds / Partial Refunds – Supported manually through the Authorize.Net Merchant Interface. 1.1 - 2/11/14 - Now sends the primary store currency code to Authorize.net. NOTE: Currently, Authorize.Net processes transactions in Europe with six major acquirers in four currencies: GBP, EURO, USD and AUD. One gateway account is required for each currency, however merchants can accept Visa, MasterCard or JCB cards from customers worldwide. The customer’s card will be charged in the currency of the gateway account, and the merchant account will then handle any currency conversions. nopCommerce version 3.00 plugin that supports the SIM (Server Integrated Method) of Authorize.Net. nopCommerce version 3.10 plugin that supports the SIM (Server Integrated Method) of Authorize.Net. nopCommerce version 3.20 plugin that supports the SIM (Server Integrated Method) of Authorize.Net. Copyright © 2019 Effective Systems, LLC. All rights reserved.